It’s time to stop running your site like it’s still 2012! Discover what’s happening right NOW with site elements involving security, performance, visibility, SEO, and more, plus what’s coming down the pike. Updated 5/8/17 This webinar replay has been made publicly available. See it here. Join me for this zero pitch, all help, no hype fire hose of info you need. Share this post with all of your site owner friends and groups! Y’all know I constantly keep my ear to the ground with all things related to site ownership. Plus, you know I had a private chat with Matt Mullenweg a month ago and I’ve been sort of quiet about a few things until I could check them out. Well, now I’m ready to spill the beans on all of it. I sure hope you come to the live webinar because we will have time for discussion. But if you can’t, a replay will be available for a limited time. The last one of these I did nearly two years ago on Blab predicted the perfect storm of change we’re experiencing right now. This is a zero pitch, all help, no hype webinar. And it’s a discussion you can’t afford to miss, literally. I’ll be showing you the money, for real. 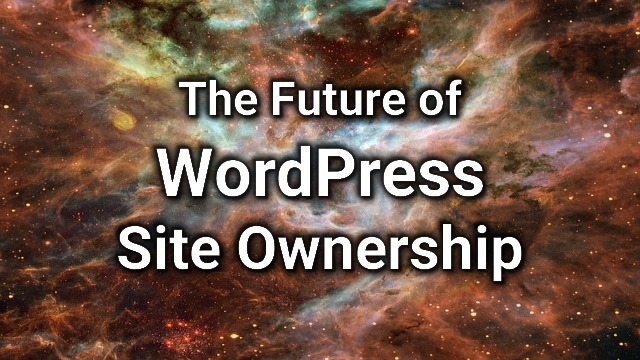 Nothing about site ownership is business as usual anymore and it’s time to update your mindset from 2012. And to stop listening to folks who still talk from that perspective. Get in the know with NOW so you can make better decisions for your business as a site owner.